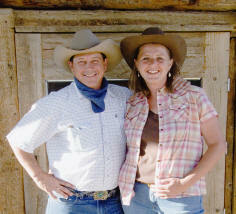 your hosts at Escalante, Utah's Wild West Retreat. The Wild West Retreat has been a dream for Shannon and Jenifer since 1996. Their appreciation for all things cowboy and Western comes through in the wonderful architectural details ever present throughout the barn building, from the solid Ponderosa tree trunk to the gnarled root that doubles as a door handle. Shannon and Jenifer have been hosting private dinners for groups of 12 - 500 that they cook in their traditional dutch-ovens over a bed of coals. The old west has never tasted so good! Their beautifully landscaped grounds are part of the dining experience. If you happen to stay in the Wild West Retreat during one of these shindigs, come down and join the party - - - dinner is free!! !